When Arrow Season 4 airs in the fall, Oliver Queen and Team Arrow will be fighting an assortment of new DC villains. Damien Darhk will be calling on Starling City with his organization H.I.V.E., and noted Batman adversary Anarky will also be causing trouble. Of course, while Oliver is dealing with these guys in the present, flashback Oliver will be handling his own problems, and while we don’t exactly know what is in store for his fourth year away from home, we now know the identity of one of the evildoers he’ll be going up against: Baron Reiter. According to THR, Jimmy Akingbola has been cast as Baron Reiter, who in the comics is known as Baron Blitzkrieg. No other details were provided about Reiter’s role in Arrow Season 4 other than he will be a recurring character. Reiter is the latest comic book villain that Oliver is pitted against during his five-year exile. He went up against Edward Fyers in Season 1, Anthony Ivo and Slade Wilson in Season 2, and Amanda Waller, China White and General Matthew Shrieve in Season 3. In the comics, Baron Blitzkrieg was a Nazi solider from Earth Two who commanded a concentration camp. After an inmate managed to throw acid in his face, German scientists were able to restore Blitzkrieg's sight, but he was left permanently disfigured. 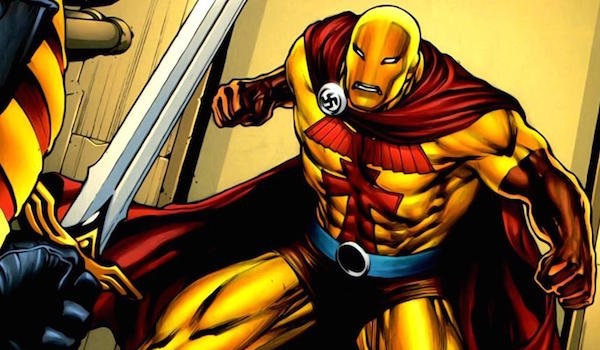 The Nazi commandant then underwent experimentation and gained abilities like super strength, flight and heat vision, though only one power could be accessed at a time. Blitzkrieg went on to be the leader of the criminal organization Shadowspire, and he often went up against superhero foes including Wonder Woman and Superman. It’s unclear how much of Baron Blitzkireg’s background will be retained for Arrow’s Baron Reiter, though it’s highly unlikely that the Nazi aspects will be brought to the forefront. It would be interesting if Shadowspire is incorporated into the show to provide that recurring parallel between the present day story and flashbacks. While Oliver is dealing with H.I.V.E. in the present, Oliver has to fight Reiter and Shadowspire in the past, and in the process takes another step towards becoming the man fans met in the pilot. In the Season 3 finale, flashback Oliver boarded a boat headed for Coast City, but we’ll have to wait and see whether he makes it to his intended destination. Akingbola is primarily known for his TV projects in the U.K., like Holby City, Rev. and Ballot Monkeys. He also recently guest-starred on the History Channel miniseries Sons of Liberty. He is the fourth new actor to be added for Season 4, following Neal McDonough, Echo Kellum and Alexander Calvert. Arrow will return with new episodes this fall starting Wednesday, October 7 on The CW.